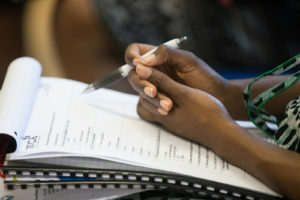 Above – Students involved in the programme have been recording their progress in order to make a video diary. Mia Weatherhead has won the sixth annual Wandsworth Young Chef of the Year competition. 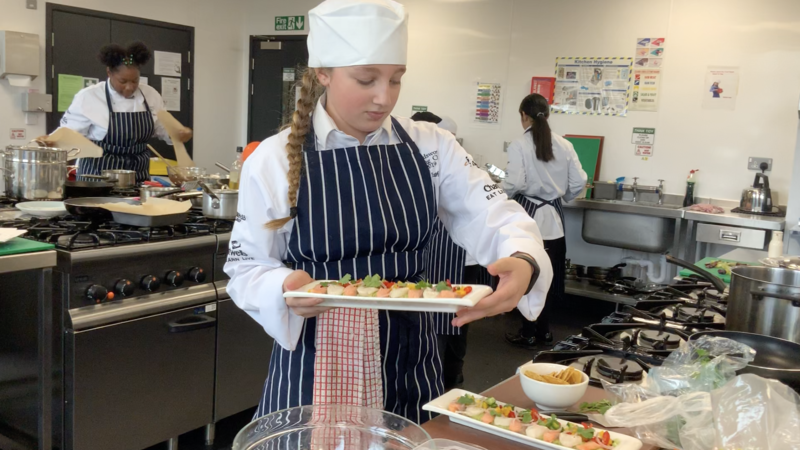 Mia, who attends Graveney School, impressed judged with her menu of salmon and scallop ceviche followed by chicken wrapped in Serrano ham with saffron sauce and chorizo croquettes. Desert was crème Catalana. 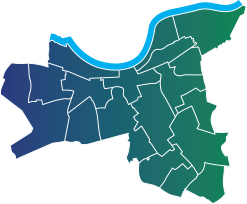 The Young Chef competition is run by the Mayor of Wandsworth and the council’s lifelong learning team. It nurtures young talent, teaches young people how to cook good healthy food to a budget, provides a chance to learn from the experts and helps young people get a foothold in the catering industry. Francesca Sparrowhawk from Graveney school was second and Tenley Fuentes from Ernest Bevin was third. The other finalists were: Aisha Syeda (Burntwood School), Remi Ebanks (Ark Putney Academy), Rose Picicco (Southfields Academy), Alife Turner-Smithson & Zakereya Ahmad from (Ernest Bevin College), Jake Gratrick (Saint Cecilia’s) and Maia Blackman from Chestnut Grove Academy. Each of the eight finalists won high street vouchers. Mia won £120 and a crystal trophy. The finalists will now all take part in a celebratory lunch at the Taste Restaurant, Merton College on May 3. The menu will be inspired by the dishes produced by the finalists and students will get the chance to prepare the lunch alongside Daksha Mistry, former Master Chef finalist. The event will be attended by the Mayor of Wandsworth, Councillors, parents and local employers, including those from the hospitality industry that have provided outstanding support to the young people involved in this project. 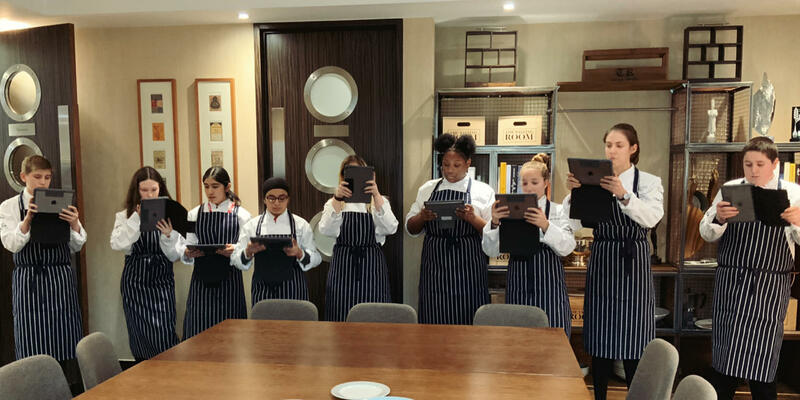 As part of the competition, the Young Chefs have already benefited from attending two masterclasses at Billingsgate Seafood School and Compass Innovation Centre in Chertsey. 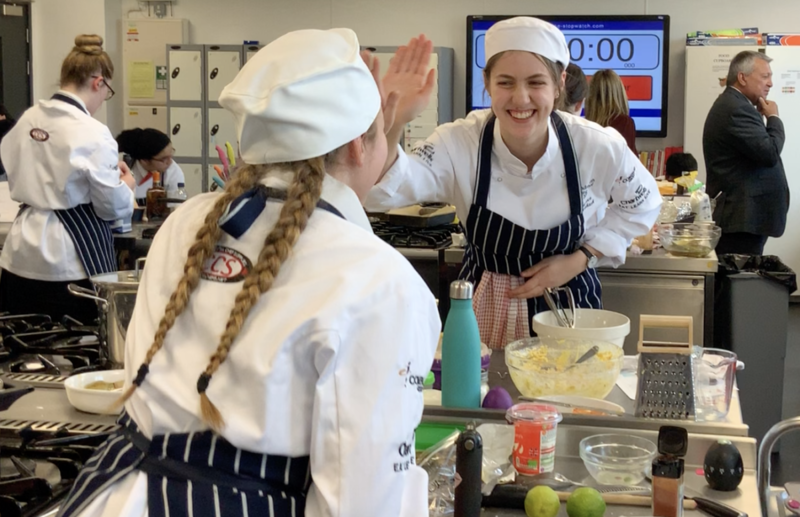 Support for the competition was provided by the South Thames College catering school and major catering company Compass Group UK & Ireland, which has been involved with the competition since it launched in 2013. Chefs from Compass judged the final, overseen by Culinary Director, Compass Group, Nick Vadis. Joining the team this year was local Instagram Chef and entrepreneur, Sarah Kettel. Young Chef is funded in part by the European Social Fund/GLA Careers Cluster project Pan Out. Pan Out is aimed at promoting careers in the hospitality industry and has enabled this and other initiatives such at the Tooting Streetfood Challenge that have supported students in Wandsworth.